La Roche Posay Physiological Cleanser is possibly the best thing I've ever used on my face. besides, the effacluar duo and my trusty nuxe moisturiser. I am like the laziest person with skincare - I'm sorry skin, shot me - but I've really got into it since christmas and I've been loving, my only regret is not doing it earlier. When i first bought this product, i hated it, literally hated it. Then when i found out you didn't have to wash it off, it was the best thing ever. I couldn't recommend it enough if your lazy like me and have the most driest and sensitive skin on the face of the earth. La Roche Posay Effacluar duo is also one of the most amazing products ever. I won't go to in to it and i want to do an in depth review of it, but all I'm saying is that if you like me, have lots of those stupid annoying tiny bumps under your skin - seriously what is the point in them, they are so good damn pointless and annoying - then you need this bad boy in your life. My favourite skincare saviour for winter would have to be E45. My oh my, my skin would look like crusty puff pastry if this wasn't around. its disgusting, i may aswell just be a massive cheese straw thats been crushed. Ive only just started using it and it makes the biggest difference, i don't know why i wasn't using it before. It so cheap as well for a big tub, if you've got dry skin and you don't use it, get it. I use it after before i put my moisturiser on, or sometimes if I'm feeling a bit like George and want to make some marvellous medicine then i just make a concoction of this and my moisturiser. Works a treat. Eyebrows are my thing at the moment and i bloody love them. I got my HD brows kit when i used to get the Glossybox. At first, i didn't like this product, but since last year, my eyebrows have become the most important thing in my makeup routine. I live by the quote 'don't let anyone with bad eyebrows tell you what to do'. Possibly the best quote ever and i know ALOT of people with horrible eyebrows. Not nice. Personally, i like thick and bushy eyebrows, but i have had my fair share of thin, hideous eyebrows, but at the end of the day, its what ever suits you and your face of course. I use the shade medium blonde and although it looked quite like, its good when i want a natural finish, instead of a scouse brow. for some reason, i like that look. I use it along with my MAC 266 brush and this is the best eyebrow brush I've ever tried. its also the only eyebrow brush I've ever tried, bit bias but it is so true. Its the right thickness, size - just bloody brilliant. I have a difficult time finding mascaras that i really like and work. I have really stubborn eyelashes and its annoying to say the least. I love curling them and should most probably invest in some good ones, but these ones I've got from boots, work like magic and do the trick, so i can complain. I find they really make the curl stay and help to open up my eyes. Of course this is also down to the mascara and i use the L'oreal 4x voluminous mascara. Ive had this longer then i should - yolo, not following the mascara rules - and it still works. You get ALOT of product on the brush, which I'm not really a fan of, but for some reason, i kinda like it with this mascara. It gives me great length and volume and i don't think it clumps at all. In my eyes, perfecto. e it as it so cheap, especially when boots have their offer on No.7. Amazeballs. Last but certainly not least is the little beauty which is the Maybelline 24hr Colour Tattoo in On and On Bronze. There are just no worlds for how much i love this thing. Ive literally only just hit pan on it and although its starting to dry up - i certainly will be repurchasing this bad boy - its so easy and simple to use, i think my dogs could apply it. Back last year in December - I love saying stuff like ohh I haven't had a shower since last year. I have had a shower since last year. I know what you where thinking ewwwww - I was a tad naughty just after Christmas and a bit before and bought some sneaky bits. I was actually shopping for one of my best friends 21st present and so I bought some of them then, as I was jealous as what I was buying her and well my purse just automatically gave my card to the shops. I think there is some form of magnetic connection there, it's not actually me, I promise. Possessed card. I also picked up the Sigma bits from the Black Friday sales in America. They always do free shipping and well this time, my card was just there miraculously. Even worse is that I don't even need my card when I'm online shopping, as I know all my details of by heart. I think that says it all. I got a bloomin good deal on thesp Sigma bits so I couldn't resist them. Everything else, I definetley didn't need, but well yeah. Well, to be honest, I'm not sure how much wear I'm gonna get out of this, but it's for a friends 21st, do I felt I could justify it. I have done a full blog post on it, which thanks to you lovely chumbugs has had the best feedback ever. You da bestest. I will link it heerrrrrrreeee, if you want to check it out and it was also in my last video, which I shall link herrrrreeeeeee. Shameless self promotion, if you subscribe to my channel, I guarantee that you will find me really weird. I am. No but I would love it if you could check it out and it really does mean the world to me. Okay, I'm not the biggest perfume wearererererer, but this bad boy had me hooked as soon as i got a whiff of it. I am not even going to attempt describing it to you, as well, lets me honest, i would most probably make it sound like it smells of dog sh*t and from experience of having 2 dogs, its not a nice smell. I don't go around smelling it, just incase your wondering. i may a tad odd, but I'm not that weird. at least i hope. It is pricey at £39, but oh my god, its so worth it and i can see it lasting a long amount of time. I clearly don't need anymore gold or bronze shades within my makeup collection as about half of my eyeshadows are gold or bronze. I think I'm just a magpie. I like shiny things. Like the shiny show. Did anyone else used to watch it? I watched it when i was like 7. Not the typical cbeebies ages. If it was still on, i would clearly still be watching it now. Anyway, yes, these are so pigmented, creamy and just bloody amazing. If your a keen Nars fan, you may have the seen the new narsissit palette going around on the web. OH MY GOD I NEED IT KNOW. GIMME. I love washing my makeup brushes, i do find it very therapeutic, but it used to take me agessss and I'm not the most patient person ever. I wasn't expecting to makeup bloody friday purchase back last November, but well, i did and I'm am very glad that i did. This makes cleaning brushes bare able for anyone for doesn't like it. how could you not, its so relaxing, i thin k even stanley would like it. to eat. no puppy. It takes me about 30 minutes now to clean my brushes and thats so much more better then like an hour. I don't know why, but i seem to have triple the amount of face brushes then eye brushes. I literally have no idea why, but i do. its not like i can use them all at once. well i could try. ohh, i may try that now. I also got these in the black friday free delivery malarky and well I'm very impressed with them. They are so useful i didn't expect them to be that good. I think if you buy these in the UK they are like £65, but i got both the brushes are the glove for that, so i am one very happy chubby bunny. So yeaasshhh here is a haul. I have another one coming up, but i will schedule that towards the end of the month, just so its not to intense, i will make monthly ones. this isn't an excuse to do more shopping zoe…. 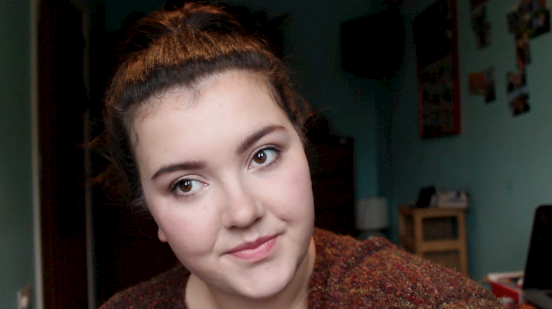 Also check out the video of it, where i do the most awful close ups you ever did see. Ohh another GRWM. I do apologise, i have done a lot of these and there is another one coming up this evening, but they are easy to film and edit. I don't have a lot of time at the moment and blogposts and videos are going to be getting very fair and few over the next 4 months. Uni work will be the death of my i swear. I am going to try and pre - film some this weekend, so any requests please let me know, otherwise there will be 6 million other GRWM. 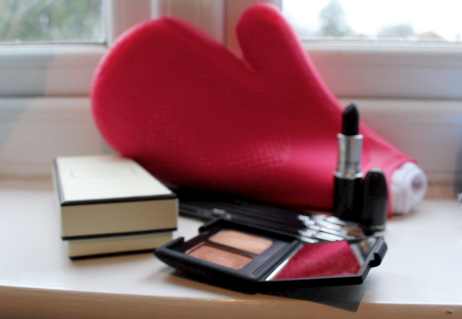 However, i was of to work when i filmed this and this was my makeup. i also apologise for looking like a cretin in this picture. h-i-d-i-o-u-s.
Who doesn't love a good bit of stationary? ME. Now when ever my sister and i venture shopping, - which isn't regularly because she wants to spend 6 hours in HMV, whilst i would rather be in Space NK or the beauty department of House of Fraser - she literally spends hours looking at cd's and vinyls. The last time we went in was back in June last year and she spent about 30 minutes picking our a birthday card for me. I didn't even get that card. Waste of my precious time. I usually think they are overpriced and just ridiculous. Some of them are though, £100 for a box. Who do you think i am Richard Branson, no I'm a student who can't afford food! This being said, i took the courageous decision the over day to enter Paperchase with my friend and although it was stupidly busy -this is why i do shopping online, i don't like other people- and everyone got in my way, i found some extremely cute pieces. We originally went in there to look for photo-albums as this year, i want to document my year and take ridiculous amounts of photos, as i don't take enough. Taking pictures of your dogs doesn't count. Or selfies. Love a good selfie. I have got my eye on a polariod camera and as soon as i get paid, I'm buying it. I did get a camera for Christmas, but i love the look of polariod cameras and my Canon is amazing and i love it, but i use it for blogging, filming and uni work - and dog selfies and pictures i think are like really good and cool, but they are actually a pile of poop. 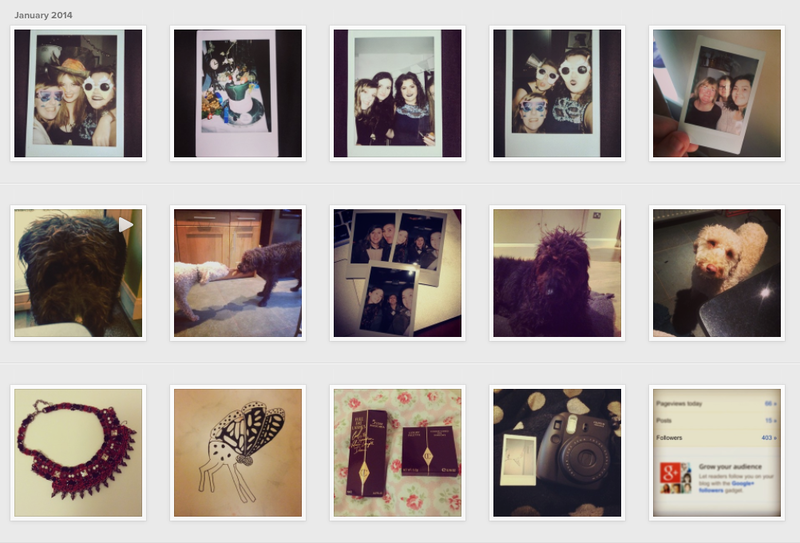 Never become a photographer Zoe. Generally can't remember what i was talking about and i am not reading through what I've written so far, too many words, but yeah i bought a super cute notepad, which is amazing. I love the way it opens and that will keep me amused when I'm bored. I actually use it for blogging and youtube at the moment, but i definitely need another one for uni. LOL i just write on my hand at uni. typical student? I also bought a fountain pen, to be more civilised, mature and grown up. Its not going to happen, but i like to think it makes me look more sophisticated. Ohh big word and i managed to spell it without spell check BOOYAH. I also got a really cute little pencil tin so I'm not rummaging around for pens and pencils. This is me trying to be organised. It will last till the end of the week, maybe day. Then i got this photo-album which i can stick my pictures on myself and have it how i want it. I want to look back at the end of the year and look through all the memories I've had. I think it will be a nice way and also cool for the future so that if aliens take over the world, they will know who i was. I will be their ring leader, so they can worship me from their. Of course aliens are real….. I also bought glue sticks. I know thrilling, I'm not going to review how sticky they are, just that they are stupidly overpriced. They actually aren't that sticky. Dissapointed. Skincare as always been a very touchy topic to me. To be honest, before Christmas i did it little one not so often. I know thats bad, but the products i had, i wasn't happy with and i was just too lazy. Having a bedroom in a freezing cold student house with a bathroom upstairs, means embracing the antarctic weathers. Not happening. Although i do like quite a harsh and less creamy exfoliator, this one is does the job for when i need to buff away my dead skin cells. I don't use this every evening as i don't feel i need to, but once a week or depending on how my skin is. Anyway, after i got sent a sample of the La Roche Posay effaclaur duo - love freebies from online and how an earth do you spell effaclaur? i found my new love and I've pretty much used it every day since. My ThisWorks cleansing water has just run out and i forgot how amazing it is. Words can't describe my love for it at all. Its just amazing. I also rekindled love with my trusty Liz Earle Tonic Water. I don't know what a tonic water does, probably should, but it feels nice on my skin, oh so soft and smooth. not like a babys bum. weird. This stuff is just the bees knees and i love it and it doesn't sting my eyes which is very good, considering i pour way to much out. I had never tried Origins before and i decided that this should be the first product i tried. Not to sure why, but i was clearly feeling rebellious. I don't feel like it does anything immediately to the skin, but it does almost exfoliate my skin quite well. I am not too sure whether it brightens my skin, but its certainly got that acid feeling in it. The La Roche Posay physiological cleansing milk, is by far the easiest cleanser ever. I mean talk about being lazy, i don't even take it off. This is what the instructions say, or i just can't read, but i pretty sure you don't have too. The E45 and Nivea moisturiser are my little pots of heaven. I LOVE these so much. I normally use a Nuxe moisturiser but as i student, i would rather spend £35 on food or have to spend it on sketchbooks. Clearly i lead a thrilling life, sketchbooks over moisturiser only lasts for 3 more months. I am sure you know what the Hydraluron does and how good it is and that is ridiculously expensive, but i have certainly seen a massive difference within my skin since using this. No more flaky bits that look like puff pastry with it crumbles. I did a video also on my skincare routine, so i shall leave it below. I think I've covered everything, but I've probably forgotten something. Definetley have. Black lipstick isn't something i thought i would be trying anytime soon, but when one of my best friends sent me an invite to her Mad Hatters black tie 21st, i knew that i had to have one. I quickly scoured the MAC website. 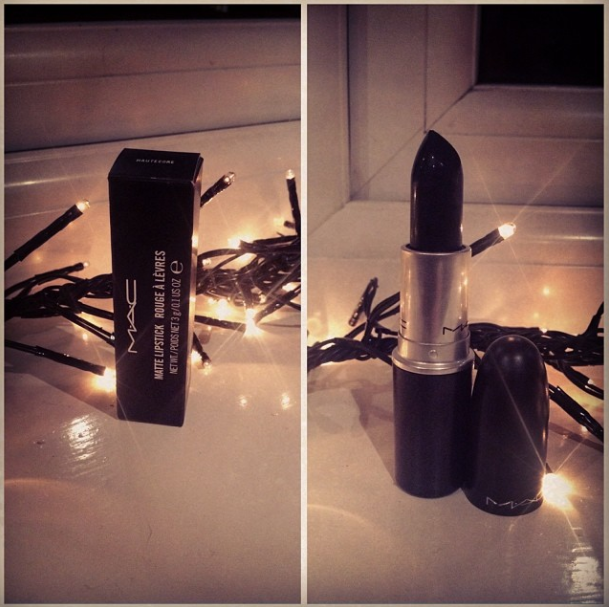 If there was one place going to sell a black lipstick then of course it would be MAC. I actually bought this from selfridges and it literally came in the biggest envelope, all for a tiny lipstick. Poor trees :( I do also apologise for the shoddy instagram picture of the lipstick itself, but by now, i think we all know what a MAC lipstick looks like. I should, I've got about 20 of them. Need to stop buying lipsticks… it will never happen. I now to sure why my skin looks bloody amazing here, but i can assure you that in real life, my skin is not like this. I am also wearing false lashes, my lashes are short and stubby. A bit like me, but I'm not short. The video is actually here. First of let me just say its nearly Christmas 2014 style. I know early thinker, but before you know it the year will gone faster then you can say eggs for breakfast. Im not quite sure where i got that from. Im watching chitty chitty bang bang and sounded like they said that. They definitely did not! Back to the point. I am so so grateful and thankful for my family for buying me these gifts and i am in no way bragging. I also got tickets to see Queen B in London next year with my cousin, aunt, mum and sister and words can't describe how excited i am. I like to think I'm related to beyonce… not a chance in the world. I have also done a video, where you can see everything in more detail, so be sure to check that out belowwwww. Anyway, i hope you had a lovely christmas and have a lovely new year.